Though Huddle won the $20,000 prize for first place, both were well under Deena Kastor’s 38:24 American record for the infrequently-run distance, a record Kastor ran en route to the Berlin Half Marathon in 2006. Race announcers declared it a world record, though the International Association of Athletics Federations doesn’t certify 12k road records. Shortly after making her move, Huddle opened up some lateral space from Flanagan, moving to the other side of Fairfax Street shortly before the seven-mile mark. Shortly after, Flanagan subtly eased up and Huddle put ground on her. “I was saving a little bit in case she had a kick, but with 600 left I didn’t hear her, so I started focusing on the record,” Huddle said. It was a few blocks from where the two of them had put their pursuers away. Early in the race, by the time the pair climbed the short, steep hill on Gibson Street, even early pursuer Lindsay Scherf had fallen off. They passed the first mile in 5:03 and had a 10-second lead on the pack. The looping course featured an average of three turns per mile, with a 180-degree turn in mile five. Despite losing, Flanagan was upbeat. Huddle came in on a hot streak, having won the New York Road Runners 5k two weeks prior when she outleaned Emily Infeld, the former Georgetown star, in 15:27. Flanagan had finished 11 seconds back. Sunday, she was eight seconds behind on a longer course. Infeld sat the race out with a back injury that has not been diagnosed yet. Huddle also edged Infeld at the USATF 5k championships in late September. Kellyn Johnson, a frequent racer in the D.C. area, finished fifth in 39:48 seven days after winning the Woodrow Wilson Bridge Half Marathon in 1:13:02. She flew back and forth between her home in Flagstaff, Ariz., but didn’t feel like the trips took too much out of her. Runners specializing in “all kinds of races” showed up for the race, which invited top 10 finishers from USA Running Circuit — USATF championships in cross country, the mile, 5k, 10k, 15k, 20k, half marathon, 25k and marathon, with bonus points for the marathon and 12k. Huddle had won the 5k and Flanagan cross country, with Meghan Peyton (ninth for the 12k in 40:32 ) winning the 20k and Annie Bersagel (eighth in 40:27) the marathon. Renee Tomlin showed up after getting notice she had qualified thanks to her performance at the mile championships in April. She’s never raced more than four miles, but figured the race would be an opportunity to do a hard long run. Kasper, a redshirt senior at Georgetown, had run one 10k on the track, but dipped into longer racing in October, finishing fifth in 57:14. At Army, she split 35:23 for 10k; during the 12k, she split 34:56. Maloy( 19th ,41:33) Tomlin (20th, 41:43) and Kasper (21st, 41:47) ran consistently between 5:30 and 5:35 per mile. “We kept trying to raise the intensity, but didn’t swing the pace too much,” Kasper said. 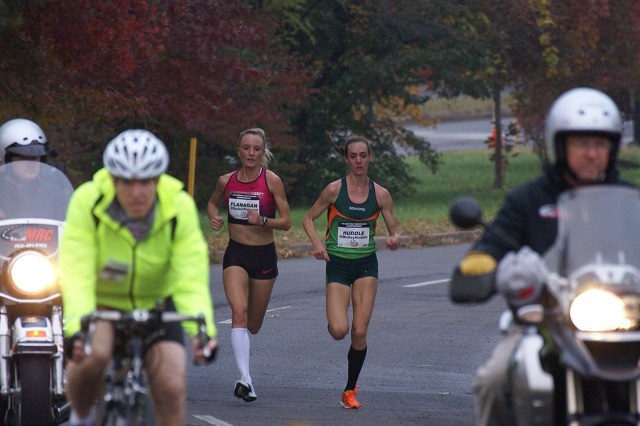 Army Ten-Miler champion Kerri Gallagher, a 1500 meter specialist based in Arlington, tried the 12k as a medium distance and finished 14th in 40:59. She hung in the pack for 2.5 miles, stuck off the back for 1.5 more, and ran alone for the rest of the race trying to stay focused, with mixed results.